Male; With relevant work experience; Can climb trees. At least high school graduate; Agile; Knowledgeable in landscaping; Can endure 8 hours of work the sun. Male; At least College level; At least 1 year work experience in manufacturing industry. Male / Female; BS HRM graduate with communication skills and pleasing personality; At least 1 year of experience in related field; Knowledgeable in hotel industry; Attention to detail; Can work with minimum supervision; Flexible; Can effectively work under pressure. Male; College level or trained graduate of TESDA in Housekeeping; At least 5’6” in height; With at least two(2) to three(3) years of related working experience in handling dining and guest in restaurant; Result-oriented person; Ability to multi-task; Can maintain positive attitude; Must be able to work under pressure; Ability to work independently and to carry out assignments to completion within parameters. Male / Female; High school graduate or Vocational course related to the position; Minimum of 1 year working experience as Automotive Electrician; Hardworking and can work with minimal supervision. Male / Female; High school graduate or Vocational course related to the position; Hardworking and can work with minimal supervision. Male; Must be a Licensed Mechanical Engineer; Ability to interact with all levels of management; High attention to detail; Computer literate. Male, Vocational or College graduate of any course, with at least one (1) year relevant experience for food and non-food items, Working Knowledge of computers, internet access, and the ability to navigate within a variety software packages such as Excel, Word or related programs, Detail-oriented and strong clerical skills, prepare reports relating to the inventory balance, shortages, defective items and price lists. 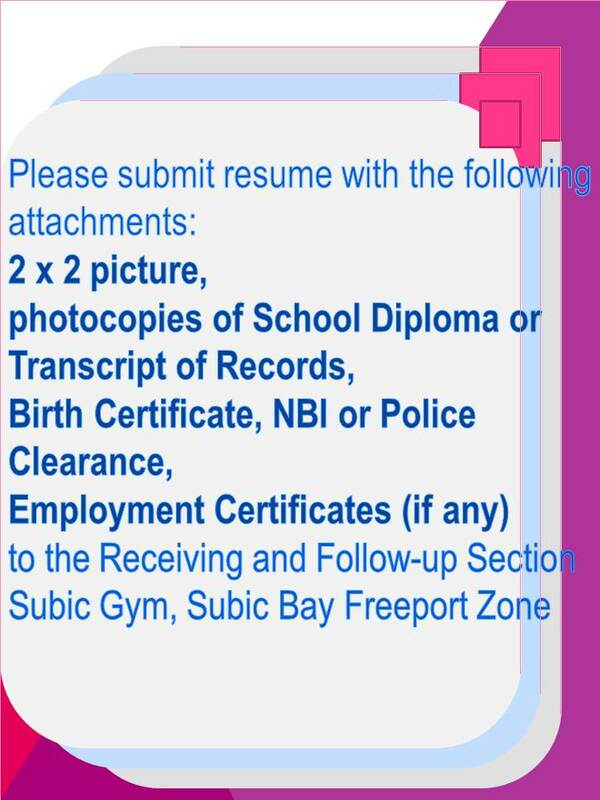 Male / Female; Graduate of any 4 years course; At least 1 year work experience; Must have accounting background; Computer literate; Familiar with places in Manila area (for bulk purchasing); Must possess strong verbal communication, negotiation skills; Must know suppliers with Olongapo and Manila; Can work on shifting schedule; Can Handle pressure; With good moral character. Male or Female, with pleasing personality, Graduate of any 4-year course, Experience on the same field is an advantage, Excellent communication, administrative, problem solving, decision making, and interpersonal skills, Ability to handle multiple task as assigned by superior, willing to work on shifting schedule, Knowledge in proper credit, check-cashing, and cash-handling policies and procedures, Ability to use suggestive selling techniques to sell rooms and to promote other services of the hotel, Knowledge in proper telephone etiquette, Knowledge in proper mail, package, and message handling procedures, Ability to communicate tactfully with, department heads and coworkers to resolve problems and negotiate resolutions, Working knowledge of computers, Internet access, and the ability to navigate within a variety software packages such as Excel, Word or related programs. College graduate of any course; Intermediate skills in MS Outlook, Word and Excel; Minimum of 2 years’ experience in a similar role; Good in verbal and written English; Strong work details and accuracy; Has good customer service skills; Ability to work under pressure and balance the competing demands; Pro-active approach; Excellent level of integrity; Ability to work autonomously and in a team. BS Nursing graduate; License is an advantage; Fresh graduates are welcome to apply; At least one(1) year of experience. Male / Female; At least High school diploma/ Vocational diploma / Short course Certificate in any field; At least six(6) months of experience.